Well the iPhone app I have been using to record all my developed loads and data has been eliminated, along with all my data. It was called “reload-IT”. It was a crappy app that I barely liked but given the lack of anything else suitable I was using it. It was cool because it was cloud based and so it would keep my data safe, across multiple devices, so I thought. Well, without even emailing me (which they did have my email, it’s how we logged in) they just evaporated. Needless to say I’m pretty bummed out. Lot of time and effort lost. So, i dont think I’ll be looking to the digital world for my next solution for records. Seems as time goes by computers make zero advancements in safety, speed or security. Oh well. So, I’d like a booklet that has fields and places for relevant data. Does anyone know of such a thing? I use excel spreadsheets and save all data on multiple computers. And I automatically backup all data weekly. I highly doubt MS Excel will be "evaporated" anytime soon. Here you go. This is off of Lyman's website. I made one, I printed a number of pages and then used a binding machine to turn it into a book. I put the same data into an excel spread sheet on my computer. That is a nice load data log. Until they dump you like yesterday's trash. Write stuff in a notebook , with a pen on paper...Oh My Lord how backwards and Low-Tech ! Who would keep notes like this....Only us old school reloaders who don't trust "The Cloud" . Call Myself, Larry Gibson and our note books old school...cause we is ! Each rig here gets it's own pamphlet. Which is simply std typing paper folded in half. Each pamphlet is well marked on the front.All data in it applies to that particular firearm. It's a journal also in that there may be info from a tooling or parts standpoint that only has indirect data but,it still applies.When the rig goes to new home,it gets the pamphlet. One of the reasons I handload and shoot CB's is relaxation..... to include hunting. For me,the last thing I want is more computer associated interface,YMMV. I started with a nice boring five-subject notebook, devoted a section to each gun. "Data entry" is any format I want and every page is compatible with my Mk1 Mod 0 eyeball. A simple piece of paper and pen has worked well so far. Several little flip note books w data wrote down, get to a point I will type it up on a word processor. Print it, review it real easy. I'm a dinosaur! Like many, I started loading long before there was electronic stuff available. I designed a form, in spreadsheet style that I use. I punch holes in the sheets and keep them in a 3 ring binder. Each caliber and sometimes individual guns have a page, or several. MTM makes one very similar. I'm learning to use I-phones and computers but I have not learned how to trust them! I use Open Office spread sheat since i am too cheap to use Microsoft. I have note books i write in as i go. Then eventually every so often i convert everything over to digital storage. I have a spread sheet realoading long and text document diary. I keep like 3 copies of the digital data that all sync. One local drive, one cloud, one thumb drive and when it syncs to cloud it syncs rhe folders and files on my phone and second computer. Maybe when i die my kids can publish it as my memoirs. Ode to Dads Addiction: The Chronicles of a closet cast and Reloader. 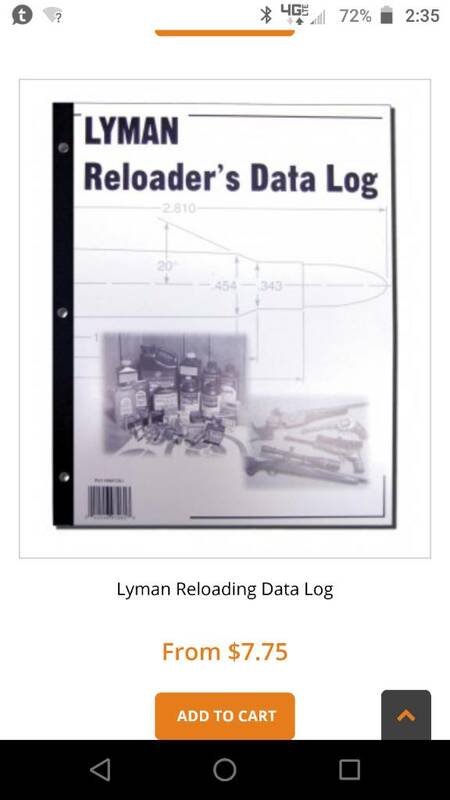 When I shoot test targets that turn out reasonably well I keep them, write the load data on it, and put it in a 3-ring binder. If it's a terrible load I put a note in the binder that it was a terrible load and may or may not keep the target. When room gets tight in the binder I'll write the "terrible accuracy" loads on a piece of notebook paper and throw away the bad load targets. The targets make interesting browsing when seeing what may or may not have worked many years ago. I do my initial record keeping in a 3 ring binder. Also input load data and comments into MS Excel since sorting and summarizing data is useful to me. I have several different backups. I do recognize that hard copy files can be lost or destroyed in many different ways, so I'm hard copy and digital. Notebooks, dividers, tabs, paper, pens, pencils and cut targets and can put in notebook. Has worked great for several decades without a charge, cord or crash! Also you do not need to thumb and finger to read and see THE page, IMHO it's not all progress. I print out, as needed, one of the templates shown here, and keep everything in a 3 ring binder.